April 20, 2000 – Florida Panthers lose game 4 of the eastern conference quarterfinals and are swept by the New Jersey Devils. This is the last playoff game for the Panthers until tonight. December, 2000 – Panthers fire coach head coach Terry Murray and GM Bryan Murray, hire Duane Sutter as head coach and Bill Torrey named interim GM. June 23, 2001 – Florida Panthers select Stephen Weiss in the first round, 4th overall, of the NHL Entry draft. Weiss would play in 637 NHL games before he makes his playoff debut tonight. December 3rd, 2001 – Duane Sutter fired, Mike Keenan hired as head coach. May 10, 2002 – Rick Dudley is hired away from Tampa Bay to become the Panthers’ GM. Jay Bouwmeester was 1 of 5 top 5 draft picks Florida has had since 2000. 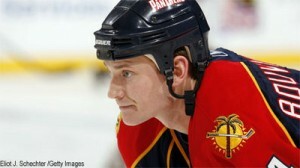 June 22, 2002 – Panthers draft Jay Bouwmeester 3rd overall. He would play 471 games with the Panthers before his negotiating rights were traded to Calgary for Jordan Leopold and a 3rd round pick just before the 2009 Entry Draft. Bouwmeester has currently played in 717 NHL games without a postseason appearance. June 21, 2003 – Panthers draft Nathan Horton 3rd overall. Horton would play 367 games with Florida before being traded to Boston in 2010 along with Greg Campbell for Dennis Wideman. Horton would win a Stanley Cup with Boston in 2011. February 2nd, 2003 – NHL All Star Game held in Florida. West beats East in first ever All Star Game shootout, a precursor of things to come. September 20th, 2003 – Paul Laus announces his retirement. He was the final Panther from the inaugural 1993 team to leave the club. November 9th, 2003 – Mike Keenan is fired, and GM Rick Dudley takes over behind the bench. March, 2004 – Rick Dudley is relieved of coaching duties, John Torchetti finishes the 2003-2004 season behind the bench. May 26, 2004 – Much to the chagrin of fans, Mike Keenan returns to the Panthers as GM, and Jacques Martin is hired as head coach. 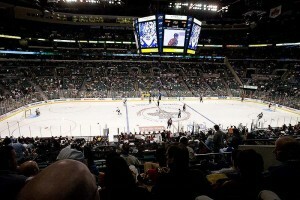 Septemeber 16, 2004 – The NHL lockout begins, resulting in the cancellation of the 2004-2005 NHL season. July 13, 2005 – An agreement is reached, and the lockout ends. June 23, 2006 – Panthers trade Roberto Luongo, Lukas Krajicek, and a sixth-round draft pick for Todd Bertuzzi, Alex Auld, and Bryan Allen. Often considered one of the worst trades in sports history. July 25, 2006 – Panthers sign Ed Belfour, who plays 58 games for Florida in the 2006-2007 season before heading to Europe in 2007. Jacques Martin was one of eight head coaches and GMs since Florida last made the playoffs. September 3, 2006 – Mike Keenan resigns, Jacques Martin takes over GM duties on top of his head coaching job. June 22, 2007 – Panthers acquire Tomas Vokoun from Nashville on a draft day deal. February 10, 2008 – In a game against the Buffalo Sabres, Richard Zednik’s throat is cut by Olli Jokinen’s skate. After quick response by medical personnel in the arena, and an emergency surgery to repair his external carotid artery, Zednik would have a full recovery and return to play the 2008-2009 season with Florida. 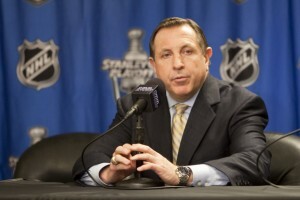 April 11, 2008 – Panthers announce Jacques Martin has been fired as head coach and GM. Assistant GM Randy Sexton takes over GM duties. June 13, 2008 – Pete DeBoer named head coach of the Panthers, his first NHL job. He would tie for 8th in the east in his first season, but miss the playoffs via a tiebreaker. Florida would finish last in the southeast division his final 2 seasons. June 2008 – On draft day, Olli Jokinen was traded to Phoenix for Keith Ballard and Nick Boynton. At the time, Jokinen was the franchise’s all time leader in goals (188), assists (231) and points (419). May 17, 2010 – Dale Tallon hired as GM of the Panthers. May, 2011 – After finishing last in the eastern conference, Pete DeBoer is let go as head coach. Summer, 2011 – Kevin Dineen named head coach. Panthers complete an overhaul of the roster, adding Scottie Upshall, Tomas Fleischmann, Sean Bergenheim, Marcel Goc, Matt Bradley, Ed Jovanovski, Jose Theodore, Kris Versteeg, Tomas Kopecky and Brian Campbell through free agency. 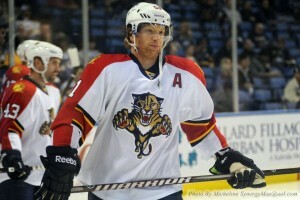 Florida also brings back the Panthers original color, red, in a new jersey. April 5, 2012 – Despite a loss to the Washington Capitals, the Florida Panthers clinched their first playoff spot since 2000 thanks to the Buffalo Sabres loss. April 7, 2012 – The Panthers clinch their first division title in franchise history with a win over the Carolina Hurricanes. April 13, 2012 – Florida plays in their first playoff game in almost 12 years.